Projected light artist Kevin Cain brings his new work The Illuminated Palace to the windows of the California Historical Society, the latest installation in Engineers of Illumination, a projected light series honoring the stunning achievements of the 1915 World’s Fair. Through the work of six light-based artists, each projecting an after-dark artwork in the CHS gallery’s front and side windows, Engineers of Illumination brings to life the innovations of the 1915 World’s Fair with modern technology. The Illuminated Palace combines lensless camera techniques from the dawn of photography with contemporary digital views to capture architect Bernard Maybeck’s vision of the Palace of Fine Arts as a fleeting ruin. “Maybeck spoke of his desire to free the Palace from the obligatory physical limitations he understood all built objects in the world must have,” Cain explains. 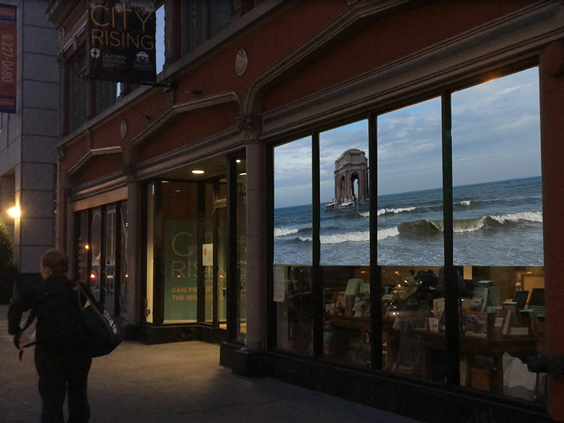 “If the Palace is a chrysalis, the butterfly Maybeck sought is something his contemporary Rose Macaulay’s lovely phrase sums up: ’the pleasure of ruins.’” Through the use of light, Cain explores Maybeck’s fantasy of dematerializing the Palace, weaving into his projections a likely future in which a rising Pacific may claim the Palace and its lagoon once and for all. About the Artist: Kevin Cain is the founder and director of INSIGHT, a non-profit organization that brings computer vision techniques to the fields of science and the humanities. For more than thirty years, he has explored art and computers, working with pioneering media, video and performance artists and bringing computer art and visualization projects to museums and archaeological organizations worldwide. 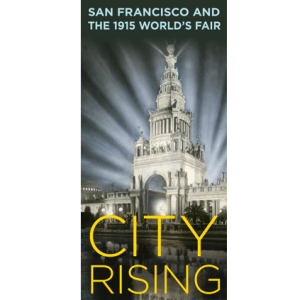 Engineers of Illumination: A Projected Light Project by Optic Flare coincides with CHS’s exhibition City Rising: San Francisco and the 1915 World’s Fair commemorating the 100th anniversary of the Panama-Pacific International Exposition (PPIE). Six rotating light-based installations, each running approximately six weeks at CHS, are viewable from Mission Street or Annie Alley every night from dusk until midnight. Artist receptions and installation openings are held during Third Thursdays in Yerba Buena. Other artists in the series include Scott Stark(Shimmering Spectacles), Kerry Laitala (The City Luminous: Spectral Canopy Variation), Ben Wood (Lopa Pikta [Rope Picture]), and Elise Baldwin (Field of Vision). The series concludes with a reprise of all five artists’ installations. The exhibition and installation series are part of the PPIE100, the Bay Area’s year-long citywide centennial celebration.